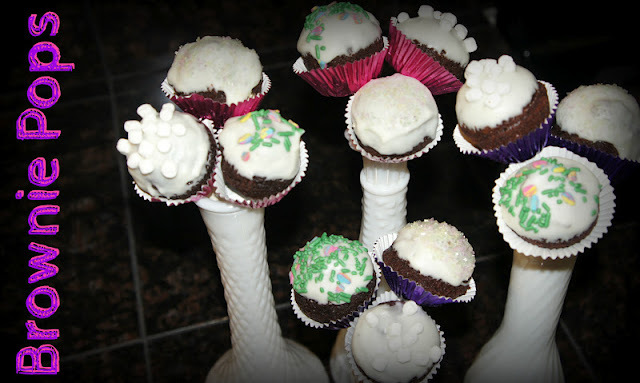 Today I am sharing some Brownie Pops that we made for my daughters class birthday party. They turned out super cute. She didn't want the brownie completely covered with chocolate glaze, so we came up with something just as fun. We started by making our yummy brownie bites in the cake pop pan. Yum! We had some extra batter so we also used a mini muffin pan. Next melt some chocolate, we used white chocolate, and grab some pop sticks. Dip in the chocolate and place into the brownie pops. I did the same with my mini muffin brownies. Then put them in a foam board to set. Time to get out the fun toppings. We used mini dehydrated marshmallows, sprinkles with easter egg confetti and multi-colored sugar crystals. With the remaining chocolate and once the brownies are secure on the sticks, dip half of the brownie in the chocolate. Sprinkle with your fun toppings. Set aside to dry again. They are pretty. Aren't they? To finish these and add a little more cuteness! Yes that's a word. 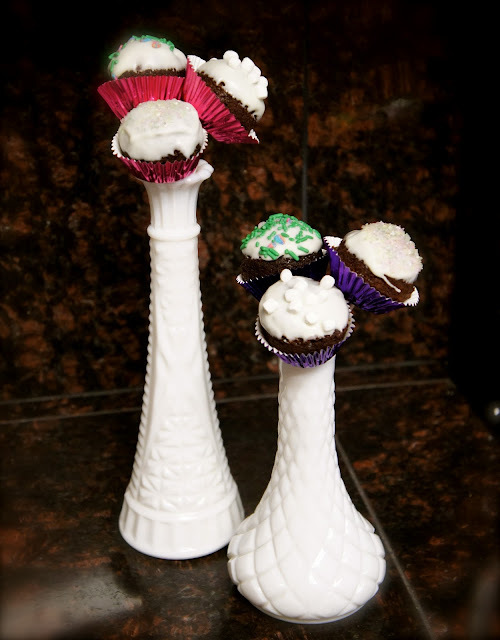 ;) We added mini cupcake liners. Just cut a small hole in the bottom so its easy to slip on the sticks. We put ours in this pan to take to the school. But first we took some cute pics. Then enjoyed them! These were very good! I will make them again!